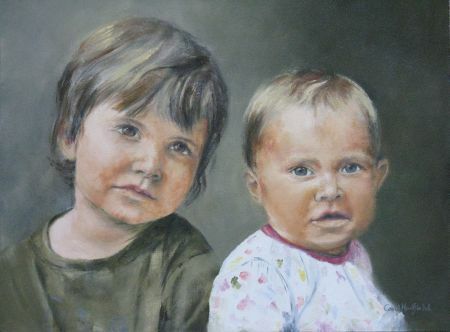 This painting was a commissioned artwork which thankfully the parents loved. I thoroughly enjoyed painting it and am happy with the finished product. This double portrait is really excellent, Carol! The muted colours give it a timeless feel. A lovely painting to own even if you do not know the children! Thank you so much Marie.It is actually amazing how much you learn about a child while doing a photoshoot. It all helps when painting them. It is really lovely - well done - and I like the new look blog! Gorgeous work Carol, I am not surprised the parents loved it. Double portraits are always so difficult for me. What sweet expressions you have captured!!! You are a very courageous woman. Lovely! Thanks for the visit Barbara, and the comment. That is high praise indeed, coming from a great artist like you, thank you. Thank you Kathleen. This was my first double portrait but I did a photo shoot first which helped to find out more about the characters of the children. I must say that I thoroughly enjoyed it!